This is a wonderful little annual gem suitable in the border or rock garden or any other place where it can enjoy full sun. The common name is moss rose although it is also erroneously known as purslane. Purslane is a relative in this plant family that has single yellow flowers and much broader more leaf-like foliage. It is considered a weed by most everyone except those who like to prepare and eat it like a vegetable. 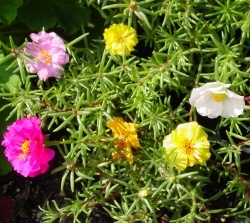 Portulaca has small pointed and plump succulent cylindrical leaves of a somewhat greyish green color on spreading branches. The flowers appear on the tips of branches. They are continuous bloomers during the hot summer months. Flower colors range from pure white through dark purple with the exception of blue. There are single and double varieties. The long lasting blossoms are about one inch across with a vibrant satiny look and feel. Flowers close in mid afternoon after a hot day in the sun. Newer varieties are bred to stay open longer. This annual plant is very easy to grow from seed or starter plants available at your local garden center. It is also possible to root cuttings from mature plants. The seed is very fine. Select a well drained spot that gets full sun for most of the day. Sow seed after all danger of frost has passed by scattering on moistened soil. Tamp down or very gently water in. Keep area moist until seedlings appear. Because they are low growers and spread as much as two feet, portulaca make a useful and lovely groundcover. Once plants emerge and are large enough to handle, thin to stand 8 to 12 inches apart to obtain dense coverage. They are easy to thin when young by just pinching them off at ground level - or you can use a teaspoon and carefully transplant them elsewhere. Established plants need little water except natural rainfall. Keep them on the dry side and don't water unless soil is extremely dry. Fertilize only occasionally maybe once or twice during the summer. Deadhead spent bloom and prune long straggly branches to encourage more flowers. If conditions are right, there are few problems or pests to contend with. Most problems, if any, are directly related to overly wet conditions where you may encounter fungus diseases such as stem or root rot or pests such as snails and slugs.